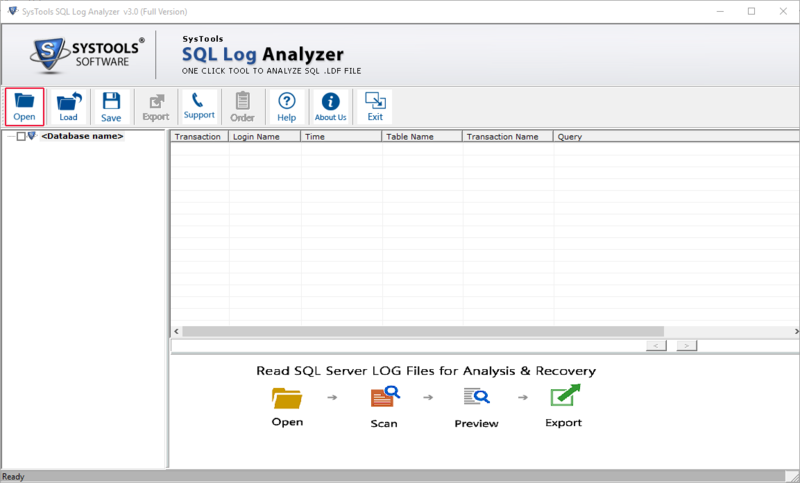 SQL Log Explorer plays a vital role in analysing, repairing the LDF file and password as well. Along with that, also allows to examine the NDF file. 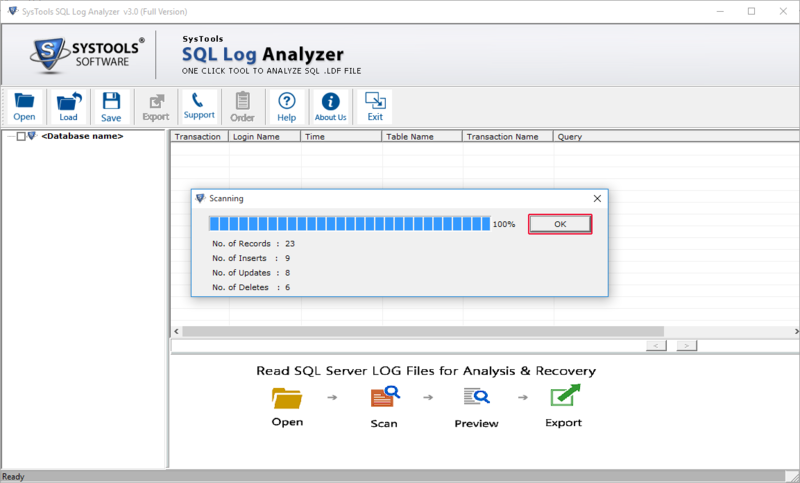 Quickly analyze the transactions of SQL log file and helps in LDF file recovery. Explore and read every transaction: DELETE, INSERT, UPDATE etc. Preview each LDF Activity: Time, Transaction, Name, Query and Table Name. Facilitates with the view and fetching records from Live Database. Also repairs deleted records, In case the database is in Simple Recovery mode. Presence of .mdf file is mandatory to perform the analysing process. 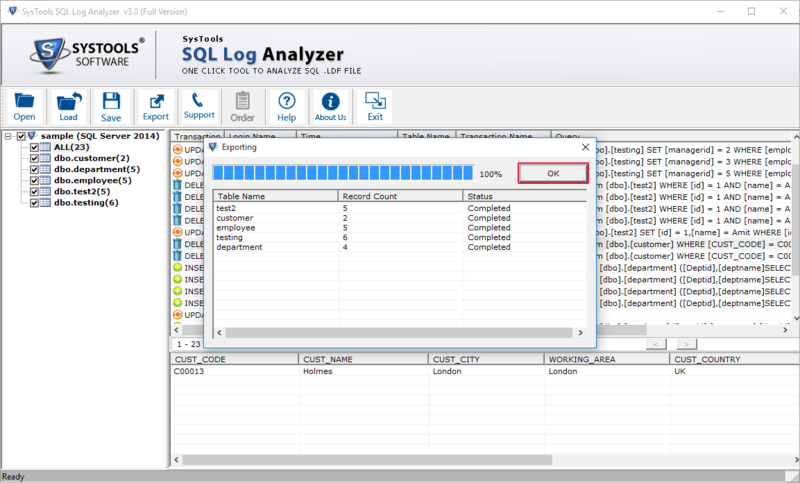 Also supports the forensic exploring of SQL Server log files. This software application works online and in offline environment of SQL database. Also supports advanced data types: datetimeoffset, Datetime2, hierarchyid, sql_variant, geography and geometry. Supports SQL Server 2017 LDF files and below versions. Supports Windows 10 and below versions with 32 and 64 bit operating system. SQL Log Explorer tool permits you to fetch all the records of database online using correct credentials. So that, You can preview the entire records such as UPDATE, DELETE, INSERT etc. With this, you can connect to database online to access the transaction logs. 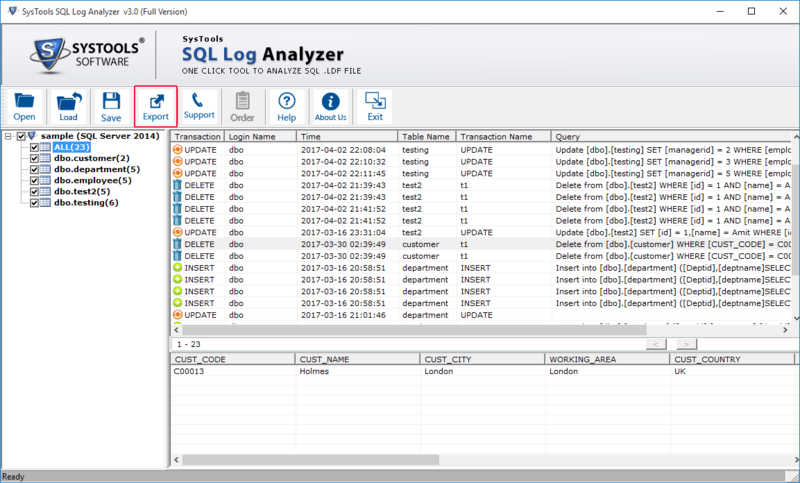 Using SQL Log Explorer, entire SQL Log activities can be read, open and preview. Preview activity includes: Transaction time, transaction name, query, table name etc. 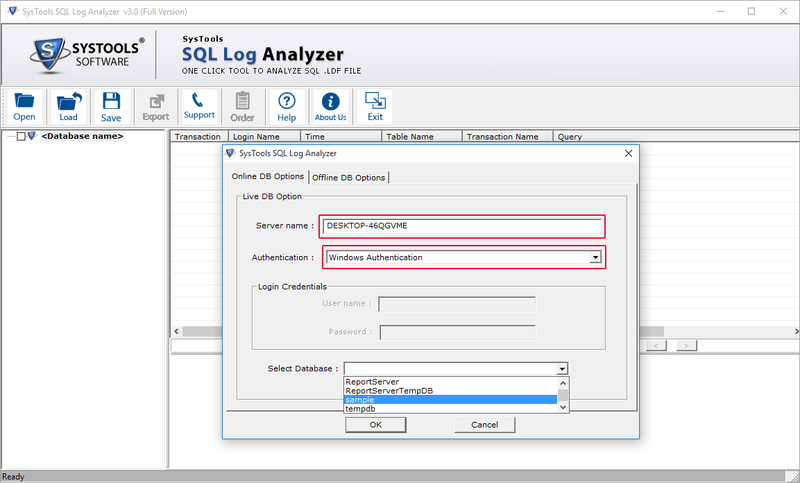 Since, SQL Server stores all its transaction and activity logs in .ldf file. So, It is easy to find out the expected reason of SQL Server corruption. This tool loads and scans all the tables of SQL database and provide a preview of all transactional activities stored in LDF file. 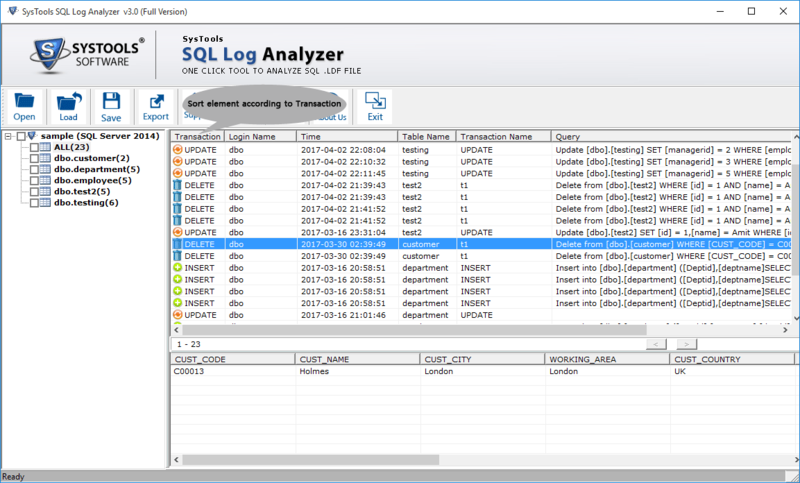 This LDF Viewer facilitates with the view of transaction logs like: Transaction name, time and query. You can also view the records with Login Authentication for Delete, Insert, Update etc with their other details like id, class, status and name. -- Export as SQL server compatible SQL Scripts. -- Export as SQL server database. -- Export as CSV file. On choosing option “Export as SQL Server Database” i.e. exporting the all LDF file queries to SQL Server Database then you have to provide all credentials of the database like database name, server name, username and password. Note: In order to avoid the overwriting of present database, export data to any other location in SQL Server. 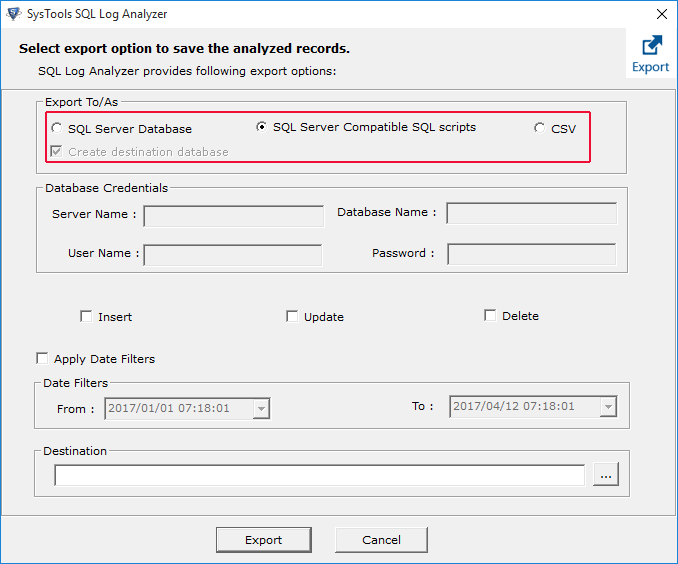 If you are in a situation to transfer repaired data to different SQL Server database then you should export the queries of SQL LDF file to the SQL Server compatible SQL scripts. From this SQL script, You can move the data in any SQL Server according to your need. This software provides an additional feature that it will automatically find out the associated .mdf file. However, MDF and LDF file should be located at the same location. Otherwise, you have to browse the location of MDF file separately. 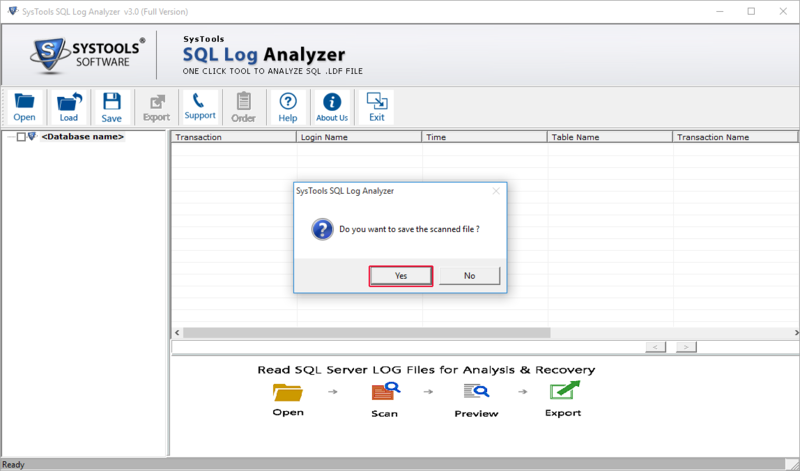 In order to repair corrupt SQL Server database, you need to provide the Login details for last backup of SQL data. SQL LDF Viewer tool permits you to analyze multiple .ndf files. With the help of this feature you can analyze data of different secondary database files to view entire records within the NDF file. An option is available of automatic sorting to re-arrange the order of list items.This tool allows you to sort the components according to their properties like as transaction time, transaction, transaction name, table name and query. During the exporting process of .ldf files, you can export the selective tables as per your requirement. You can also export particular folder or data from any specific table as CSV, SQL data base or SQL compatible script. 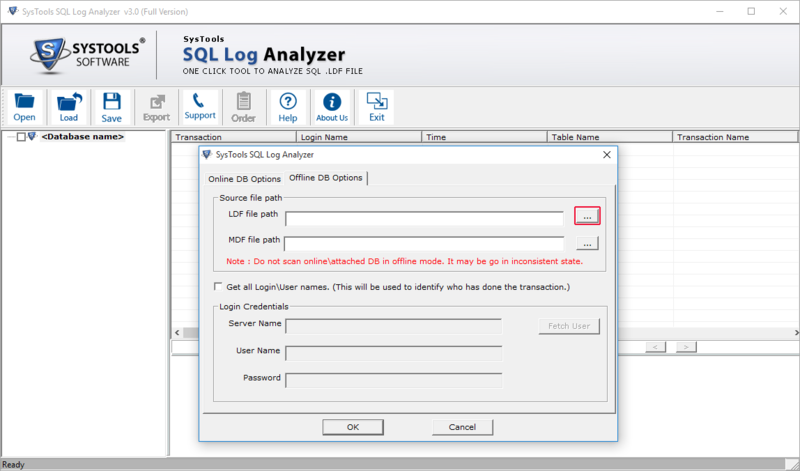 SQL Server log files with an extension of .ldf may be defined as a transaction log containing log records generated during the logging process involved in SQL Server database. A transaction is a single element for entire process. If a transaction ends in successful manner then all the modifications done to the database gets committed and permanently become a part of the database. The most effective benefit of log files is that if the transaction experiences any error and should be cancelled or rolled back then the modifications in the data will get erased. 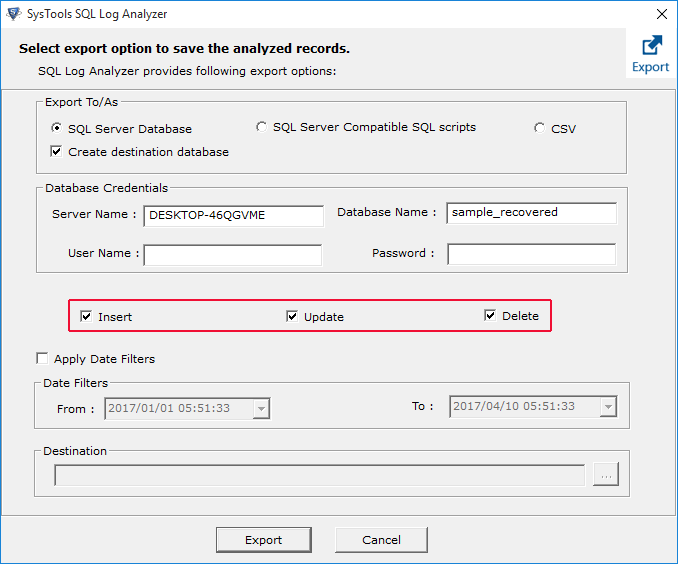 Free SQL Log Explorer will preview the entire data, but does not permits you to export the data. Step 1: Hit the Open button to add file to the software. Step 4: You can preview the details of transaction by clicking on transaction. The logs can be sorted according to their Transaction, Table Name, Time etc. Step 7: You can enable the type of transcation that you want to export.Date filters can also be applied. Hit the Export Button. Step 9: Click Yes, If you want to save the .csv file. Step 1: After selecting the Offline mode, Enter the required database credentials. Click on Fetch Userto get all the users of server. Step 2: After receiving a notification of completion of scanning process, You can save that in .str format. Step 3: Preview of all transaction logs will appear. You can choose the tables that you want to export. Click Export button. Step 4: You can choose from provided options. Date filters can also be applied. Hit the Export button. Step 5: Export process is also visible. Respond to the notification if you want to save the Export report in .csv format. Get Clear All Doubts & Queries Related to Product! Does the tool supports Windows 10? Yes, the tool supports Windows 10 OS and all below versions. Is the SQL Server environment mandatory for using SQL LDF Viewer? SQL Server is required only in case of exporting into SQL Server Database. Is it possible to view log(LDF) file without MDF file? No, It is not possible to view log file without MDF file. 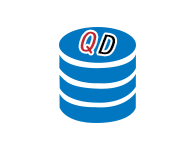 QuickData SQL Log Explorer is one of the most eminent solution to my problem. I was very frustrated in managing my SQL log files, Out of which some of the data was deleted. Thanks a lot for providing such a great solution. Due to sudden system shut down or some kind of virus attack, my SQL log files got damaged. I have tried many third party tools but i was fast running out of solutions that can deal with this. 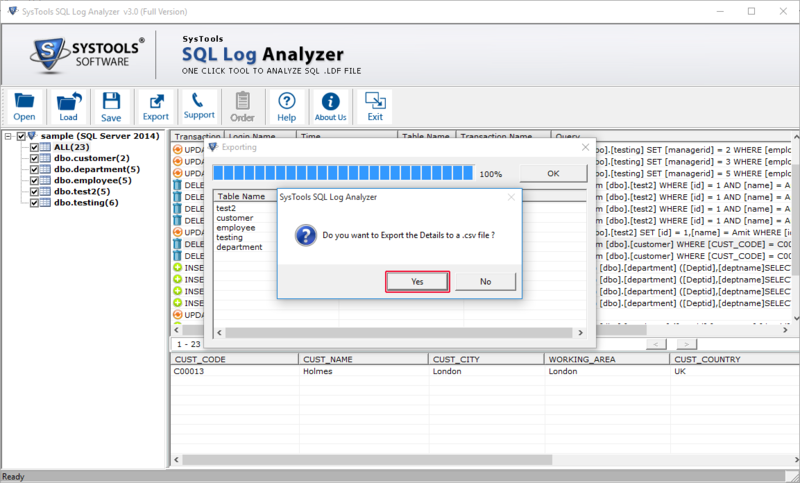 Then one of my friends suggested me QuickData SQL Log Explorer that is trustworthy and provided skillful result.